This NovomaticCasino.co.uk slot game is worthy of its royal name and is bound to turn many a pauper into a rich member of the court. With plenty of both familiar and unique symbols, as well as some classic features, this slot combines the best of both worlds: old and new! Regular players of our other slots, including Jackpot Crown and Kingdom of Legends are really going to enjoy this game. It’s great for beginners too, with 5 reels and 10 paylines, it’s quite easy to understand and a good stepping stone to something a little more extravagant! Ah, the Middle Ages: where the rich were rich and the poor were poor; where royalty banqueted and beggars starved – let yourself live the medieval royal life in King’s Jester! Among the many lucrative symbols are the playing card values, from 9 through to Ace. There are also the playing cards themselves, medieval instruments, the King, the Queen, the Jester, the x2 Jester and the Jester’s bell. The aim of the game is to spin at least two or three matching symbols (depending on the symbol) in a winning combination, in order to get a payout. The jolly Jester is the Wild Symbol and he substitutes for every symbol except the Scatter, which is his jingling Jester’s bell. You can see how much each combination of symbols will pay out, according to the size of your bet, by looking at the paytable. Apparently, medieval Kings even had people who wiped their own bottoms for them so it’s no surprise that this medieval-themed slot has plenty of features to make your life easier! You can put King’s Jester into autoplay mode so that the reels will spin themselves and give you wins, without you even having to lift a finger! You can also play for free until you’ve got the hang of the game and feel like you’re ready to play for and win real money! There is also a gamble feature, which is a classic 50/50 chance, double-or-nothing one. You’ll need to be really quick and click each step of the gamble tier whilst the light is flashing on and, unfortunately, you’ll have to do this all yourself! 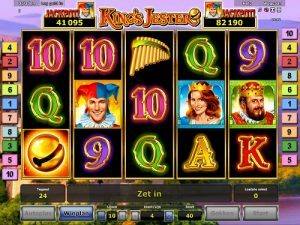 King’s Jester also offers players the chance to win free spins! Whenever three or more Scatter symbols fall on the reels, (the Jester’s jingly bell! ), you’ll be awarded 15 free spins! During these free spins, the jester himself occupies the whole middle reel and you’ll have the chance to win 15 more free spins each time you spin three more of his bells! It’s true: in King’s Jester, the Jester is most definitely your best friend. The Jester is the Wild symbol and he substitutes for every symbol except the Scatter symbols and the x2 Jester pays x2! During the normal game, spinning 5 Jester symbols on a winning payline will pay you the ‘Jester Jackpot’ which is at the top left-hand corner of your screen. During the bonus game, if you spin 5 x2 Jesters on a winline, you’ll get the ‘Jester x2 Jackpot’ which is displayed at the top of the screen on the right. Watch as the two amounts rise with each spin you play! NovomaticCasino.co.uk also offers players a variety of table games and live dealer games, including: Royal Crown 3 Card Brag, Sic Bo, Live Poker, Live Blackjack and Live Roulette. Why not give them a go and see just how lucrative they can be? Our live dealer games are so realistic, you’ll not believe you’re not playing in a real casino!